This summer has been one of quiet celebration as I experienced the mildest summer weather of my life. Of course, it had followed the most miserable winter, where we were without power for 9 days following the ice storm. The year started out with continual astonishment, trying to grasp the concept of an economy in the tank and a world where artists’ creations had no pull against economic desperation. I felt like I was wandering aimlessly in the desert. Knowing I had no extra funds available for new fabrics, materials or tools, I began to use up my scraps from previous work. The result is my “Serendipity” series. The first piece—actually created last fall— is “Reconcilable Differences which addresses the need to think of we as opposed to I when trying to settle conflicts. Caught up in the excitement of the fall election, for the first time, I actually enjoyed following politics. I decided to try my hand at a “Whole Cloth” quilt—that is, made from a single piece of fabric instead of multiple pieces. I had been experimenting with precious metal leaf. “The Energy of Hope” is the result. It is created from a layer of silk organza laid over silk broadcloth. This double layer allows for a depth of imagery. The metallic gold is gold leaf. It is very tightly quilted. After that nasty cold winter, I wanted to celebrate the promise of spring. I was ready for a happy springtime piece. So I dug through my stash of quadrants [quadrants are the quarter blocks I create to make my circles] and found cheerful, clear colors and grouped them together. I wanted the quilting to be special so I drew some wreaths of lilies, daffodils and wild rose and incorporated them into the quilting. I added some pigment to strengthen the statement. Here is that happy little piece “Sprung!”… as in spring sprung. As politics moved along I was amazed at the speed at which the old guard policies were being moved aside. “Sweeping Changes” is the result. Again made up entirely of quadrants remaining from previous work, I assembled them to create a backdrop for my message. “Sweeping Changes” addresses the issues readily kicked aside with the new administration. Once the policies that held back other directions were uncovered, new choices were given importance. This piece has lots of text—the dust being swept is the older administration priorities. What is revealed are the newer, more liberal ones. Lots of copper leaf, lots of text, lots of tight quilting. I present, “Sweeping Changes”. So what is next? Well, I have been working on getting my work seen. Currently I have work in 2 exhibitions. In Fulton, MO my work is in Celebrating Creativity at William Woods University. 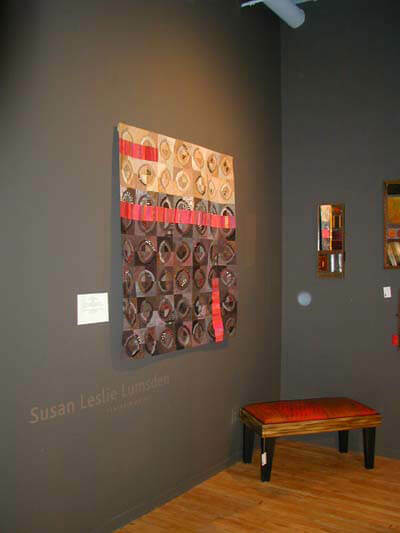 And in St. Louis at the World Trade Center is an exhibition I curated for the regional Studio Art Quilt Associates. The show is called Tactile Fluency. It will remain up until the end of October. Between the 2 shows most of my large pieces are shown. 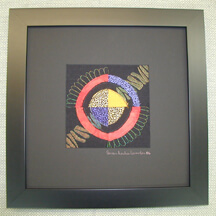 I also have most of the smaller works at Bluestem Gallery of Missouri Crafts in Columbia, MO. The first weekend in October I will have a booth at the Best of Missouri Market held at the Shaw Botanical Gardens in St. Louis. I have not done a retail show in about three years but this coveted invitation could not be passed up. So I am now working on a series of botanically themed pieces that can be produced in a limited edition and presented at an affordable price. My large scale pieces are still looking for homes. So if you know corporate or public facilities that are looking for visual focal points—I’m your gal. If you have an interest in any of my work, know that I am aware of this tighter economy and am willing to stretch out a payment plan for you. If you’d like to see detail images of some of these works, go to my website www.rebelquilter.com or if you’d enjoy following along as new works are created, my blog has the inside scoop—http://rebelquilter.blogspot.com. You could also join me on Face Book. And finally, I want to make sure you know how much I appreciate your interest in my artwork. I am doing what I love most. Sometimes in the last year I have had to explore other options in creating a dependable income. They never seem to work out like I planned, thus I refocus and dive back into my art. If you are at a point where you are ready to have my art in your home (or office) I’d love to know about it. Sometimes it is hard to keep the faith and stay on a path that is less followed. It is a life that follows the heart, based on a belief that my art not only makes me a better person but that it can help to make the world a nicer place to live, as well. Thank you for being there. What a crazy fall we have had. Fortunately, in our family, everyone has been fairly healthy. I’ve learned to not take that quite so for granted. My husband, Jon, has been spending many hours each day in final preparations for finishing his CD of original tunes. As this is going out he is in Dallas finishing recording and mixing his 10 songs. In general, his style is a laid back jazzy swing. His passion is songwriting and he is GOOD! I have spent the last couple of months allowing myself the time to experiment and develop a couple of new works. It has been a very pleasurable wandering. The first I’m showing here is called “Reconcilable Differences”. The imagery is in 2 sections. There is a large diamond shape in the middle of the quilt. Outside the diamond the spaces are very individuated—columns of strips and columns of circles. The text is “I”, “Me”, “Mine”. 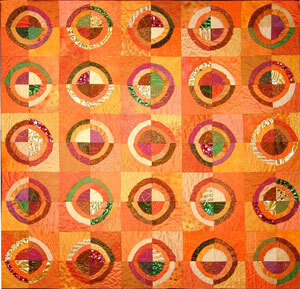 The quilting is specific to each column with no integration of lines and circles. Inside the diamond, the text changes to “we”, “us”, “our”. 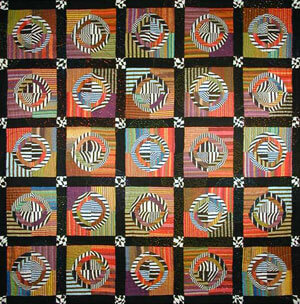 The quilting is an overall design and there is a general blending of imagery. This entire piece started as white silk. There are stamping, silk-screening, and couching in addition to piecing and free-motion quilting. This piece is about 48” x 48”. The second piece celebrates autumn and the wild ride of the economy. It is entitled”Free Fall”. I have used Gingko leaves to symbolize the season. The panels on the right side have gold leaf. There is a deliberate feeling of vertigo while viewing the piece. With the exception of 2 fabrics in the sashing (that’s the long strips between blocks), all started out as white silk. This piece is close to 4ft by 3ft. Another piece I have just completed is called “Freefall”. It celebrates the season as well as acknowledges the crazy times we have been experiencing. The size is 39” x 32”. If you would like to see higher resolution photos of any of these works please just email me or call. I’ll be happy to help you out. susan@rebelquilter.com or 417-274-1561. I am excited to tell you I have work in 2 regional shows this month. MOAK is a 4-state regional show at the Springfield Art Museum. I have only had work accepted into this exhibition once before. It is quite prestigious to be included. The museum has just been remodeled and is spectacular. I received written confirmation in today’s mail that I had earned a Judge’s cash award in this exhibition. Woo hooo!!!! My “Bass Ackwards” pieces are there. Bass Ackwards: Sunflower got the award. The reception for this show is November 15th. You may remember that a year ago when I first made these works I was frustrated because two major (in my eyes) jurors overlooked these pieces in exhibitions I had entered. I had felt they were pretty fine pieces and they were new territory for me. Well, they finally got their glory. In St. Louis, Art St. Louis’ annual Exhibition has accepted my piece, “Yikes Stripes!” There is a reception on November 22nd. ASL recently moved into new digs with a gorgeous new gallery. 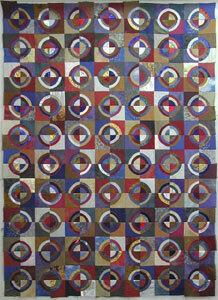 My most recent large scale work was finished in time to enter it into Quilt National. Alas, it wasn’t accepted into that venerable institution. The good news is that it is now free to showcase. If it had been accepted the piece would have been on the road for 2+ years. This way I can show it and hopefully sell it. It is quite large—6ft x 9 ft approximately in 3 three panels. As you might suspect from its size, it took several months to complete. Both front and back have imagery that is similar—the view looking up towards the water surface from below with a school of fish swarming. The light is beyond the fish. Many techniques were used to create the imagery. The fish were created using a stamp made with a glue gun. I actually drew with the glue gun to get the shapes. On the front the fish are appliqués. On the back they are stamped using thickened dyes. As usual, all started out as white silk. My seemingly obsessive desire to create imagery on the backs of my quilts opens the opportunity for their use where there is a glass partition between areas—like in an airport concourse, or perhaps along a glass curtain wall separating out a conference room. If you would like to see higher resolution images of any piece, just email me. I decided that with the economy going nuts I would do my part to contribute to making things go nicely. So through the end of the year, I am offering to allow customers to pay for a quilt over 12 months. If you have wanted one of my works but didn’t have the money all at once—this is the time to take advantage of my offer. It helps me, too, by laying in a predictable income over an extended period. Thanks to Sandy Kolde, my rep, I now have a major piece in the lobby of Barnes Jewish Hospital in St. Louis. “Burning Leaves” celebrates living in an area where it is ok to burn one’s own leaves. That was a new concept to me when we moved to the Ozarks nine years ago. I have been sending in all sorts of proposals for exhibitions, filling out requests for qualifications (RFQs) for large scale public art and generally trying to find ways around the current economic scene. Fortunately, there are parts of the country not quite so affected. Also, public art is mandated through legislation and the funds set aside at the beginning of the project—therefore not affected by local economy…but the runway is looonnnggg. I have also done 2 commissions this year beyond the 2 giant pieces. I have some open time coming up shortly if you are wishing to commission a special piece. Each day I am grateful for the creative itch that is with me virtually every waking hour of every day. To me it is a glorious joy in which I get to participate. I’ve worked hard to become technically skilled enough to pull off ideas that grace me. I have the tools and technical ability to create my art. But the ideas are the parts I marvel at. As an artist I feel it is vital that I make a cognizant decision to be open to ideas coming my way. Where do they come from? Beats me. But it feels like it is an “ask and receive” situation with the universe. Early on, I was very enthusiastic about implementing what I thought of as “my” ideas. It seemed very important that I could identify them as “mine”. More recently, I feel that it is a matter of putting out a line. I often feel like what I think a skilled fisherman must feel. If the line wasn’t put out, no ideas would flow. If I put out the line, chances are good, something marvelous will bite. What you may not be aware of is that I am often astounded at what shows up. If it speaks to me, I’ll probably pursue it. But it truly feels like I am simply a conduit transitioning into the physical realm what the universe had to say at that particular moment. And I feel so fortunate to be allowed to be one of the ones who do so. When you support my art, you are also providing the energy that allows me to focus on this area of creation. Thank you. I hope this finds you feeling optimistic about the future. We create our futures every morning. Create a good one!!! Wow! This spring has flown by. I am rewriting this as I had started it in February and was commenting that spring was in the air since the skunks were out getting killed while dating. Now summer has moved into full blown mode—the bee balm is getting rolling, the peonies are done as well as the irises. What a bountiful spring it was. We had 27 inches of rain in March. Really. As you may have learned from my last RQN, I won’t be on the road this year doing art festivals. Instead I am staying home, for the most part, and concentrating on creating new work. In fact I have just completed a 6 month long project—“Visions of Plenty: Slipstream Adventure.” This piece is quite...well...huge. 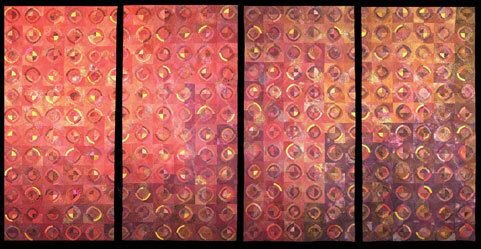 The final dimensions are about 7 ft high x 13 ft wide in 4 panels. And here are 2 detail shots from the 1st and 4th panels. My dream for this piece is for it to find a home in a very public locale. It would be perfect hanging against a glass curtain wall as both sides are designed to be seen. Here’s a photo of the backside. As you can see there is very tight stitching and plentiful use of metallics. The blend of colorations from the scarlet to the eggplant and onto the nut browns included over 200 different fabrics and up to 7 textures. Silk is the prominent fiber but lots of cottons and nylon metallics are present as well. Here’s a photo of magic time for the piece I am currently working on. It won’t be quite as large as the last piece. I am preparing about 150 blocks so I’m thinking it’ll wind up being about 6ft tall x 9 ft wide. I’ll be doing it in 3 sections. BTW—by breaking it up into sections like this it could be hung in such a way as to climb a stairwell. Many of the new high volume homes being built have huge walls and startling acoustics. A piece of fiber art can help tame those acoustics. This will be my Quilt National Entry. I have just finished a commission for Missouri State University for their Plaster Student Union. Here’s a photo of the piece. It is entitled “America: strength through diversity.” The colors are mostly federal blue, tan, maroon, taupe plus several metallics and skin tones. 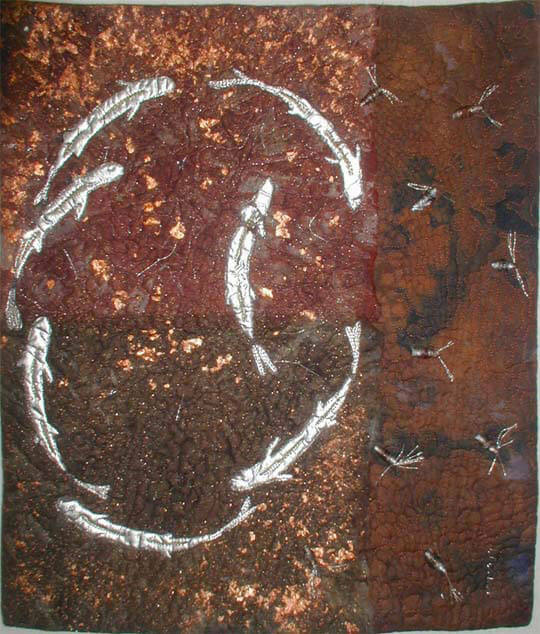 The quilting is mostly 42 hand prints of various sizes done in metallic threads. Well that’s all for now. If you have questions regarding one of my works, please call me. I am happy to take your call. 417-274-1561 If you need to be removed from my mail list—just email me and I’ll remove you. There may be even simpler directions at the bottom of the page. Have a great summer. It has been months since I sent out my last Rebel Quilter News. For those of you who have subscribed to my blog you will be much more up to date on my happenings. (http://rebelquilter.blogspot.com) However, with more than 400 of you specifically on this list, I know I owe you an update. Earlier this year I was pleased to receive 3 nice awards plus had a major exhibition in Dallas. 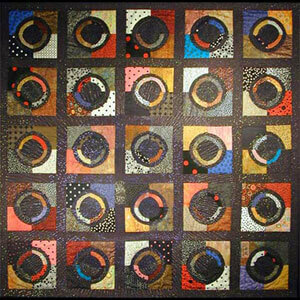 Two of the awards were the 2007 Niche Award for quilting and the honor of having my work as the featured art on the 2007 Missouri Art Awards poster and invitation. In February my work hung at the MADI Museum in Dallas amid much fanfare and reunions. Since that time my life has had some rather dramatic changes. In the late summer my work was awarded “Best in Show” at the Best of Missouri Hands exhibition at William Woods University. So now to the rest of the news… I have had a major change in the way I am approaching both the business of my art and the art itself. It seems to me that the economy has been in a crisis for at least a couple of years now. This has been apparent in that the sale of art at festivals has largely declined. Most artists are making their drives home thinking “well this was another character building experience.” As an artist who has actually depended on that income, this circumstance is not a fulfilling one. So I have decided not to do any more art festivals—no matter how good they are reputed to be—until a radical change occurs in the economy. I have spent my creative juices trying to out-guess the public’s taste and buying preference—time better spent on more rewarding avenues. Instead, I have decided to stay home and create the work that most makes my heart sing. That translates to works that are quite large—public art magnitude. I have a dream to have my art hang in very public places where they can create uplifting emotional experiences for large numbers of viewers—like airport concourses, public lobbies of corporations and public buildings. To that end I am currently involved in a large project that is taking many months to complete. 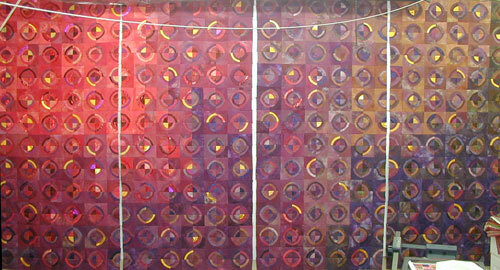 Here is a photo showing the fronts before quilting. I am currently quilting the left most panel. The finished size will be 7ft x 13+ft in 4 panels. 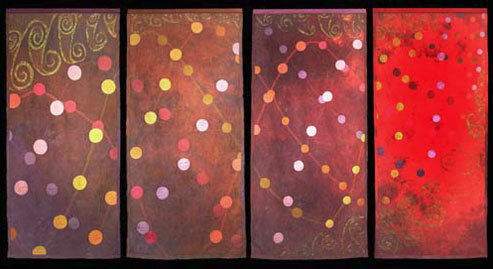 Because it is in multiple panels it would work well going up a stairwell or even hanging in a square in an atrium. I started dyeing the fabrics back in August. Please keep your eyes open for either a sales opportunity or even display opportunity for this big piece. I hope to have it done by the new year. This doesn’t mean I will no longer do smaller works. I’d be happy to do smaller pieces. Just not on spec. In other words, if you want me to make a smaller piece just for you—I am happy to do so. I’m just not doing smaller pieces in hopes that someone will get excited enough about it to buy it. I will still probably do the framed pieces because they are made from the remaining blocks from my larger works and fine crafts galleries have found they sell. In the meantime—I am also concentrating on my scarves again. This time, primarily for the wholesale marketplace. 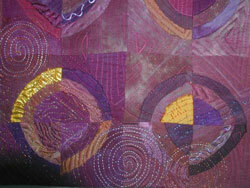 This has the advantage of adding prediction to my work needs and allows plenty of time for me to create my quilts. So if you have been waiting to see me at a local art festival—it’s not going to happen. I am very easy to contact and have the process of creating custom work simplified. So don’t hesitate to request a custom piece. Also, I have now turned the front part of my studio into a small gallery. I finally have a place in my studio I can sit down with a potential client and review my work or their needs! The address for my studio is 219 Chestnut St. Thayer, MO 65791—just 2 blocks from my home. While I am in the studio a lot—I don’t keep regular shop hours. If you plan on visiting my gallery, please call ahead—417-274-1561. Another reason behind this change is that my parents moved in with us in October 2006. In May my father died. My mother is quite frail and my being gone a lot wasn’t fair to my husband. So I am happily working in my studio—close to home. My work can also now be found at Blue Moon Art Gallery in Hot Springs, AR. www.bluemoonartgallery.com. They are representing me for my median sized works. I would like to associate with a major gallery in at least 2 more large markets. If you can recommend a gallery relationship to me—well I’d appreciate it. For large scale corporate work my representative is Sandy Kolde at ARO. She can be reached at www.artresourcesonline.com. I hope this update finds you healthy and able to spend time with the ones you love. We are looking forward to spending time with our children and grandchildren over the holidays. We also have a new generation of pets in our household—two 3 month old kittens. All our older pets have passed on and these youngsters are a riot and bring us joy and laughter. Please feel free to contact me regarding any projects or artwork. I can be reached at 417-274-1561 or susan@rebelquilter.com. As you may have recently heard…. I got one of those awards I mentioned last time! I was awarded the Niche Award in the category of Quilted/ Pieced. This was presented at the Philadelphia Market for American Craft in late February. My next big gig is the MADI Museum in Big D. I’ll have an exhibition there that opens April 20th and runs through late July. I am currently tracking down a venue so I can teach a workshop there in July. If you have any suggestions--please let me know. Here’s a photo of two of my works for the museum show—Yikes Stripes! and Spots, Dots Speckles and Freckles. I am making quite a few smaller pieces this year. 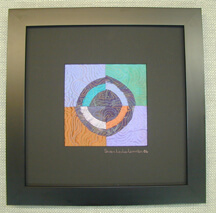 For most of my designs I am creating them in a single block framed, 4-block framed, 5-block runner, 9-block and 25-block. This gives a price range of $100- $1500. I’ll still create a couple of larger pieces each year purely to delight myself, but mostly I expect my larger works to be commissions. Design-wise I am playing with some new surface design elements. Adding layers of fused slivers and more play. Each design now incorporates more involvement. For some time now my backs have had some playfulness. Now they are nearly as important as the fronts. Also, my quilting is more likely to continue the story begun on the front. As you can see on Peach Mango Salsa, the fabrics, the painting on the back as well as the quilting are all part of the story. Watch for an article about me in the upcoming Ozarks Magazine. Lin Waterhouse, a freelance writer living in Dora, MO has chosen me as her subject matter. We’ve developed a nice friendship and I am honored to have her use her talents to make me look good. In addition to my work being at the Bluestem Missouri Crafts Gallery in Columbia, MO you may also see my work shortly at the Sturdevant Gallery in Osage Beach, MO. That is near Lake of the Ozarks. It is a lovely new gallery that should have a nice regional presence. Since you are likely to ask, my parents are doing quite well. I’ve scheduled most of my shows this year to be within a half-day drive of Thayer. Although Mom is still needing help going up and down a step or two she is much better and no longer on heavy pain medication. Dad has been such a godsend in that he is gung-ho in the garden. Since our yard has been totally neglected for the last couple of years as I ran around the country and back and forth to Springfield, we are thrilled that Dad has been cutting back the jungle and we now have a nice raised garden with salad greens growing. Have you had a chance to stop by my blog? As I create new work I am documenting it immediately. You can see the progress of any new work and leave comments very easily. Go to rebelquilter.blogspot.com . Please also take a minute to subscribe to the blog. That way you’ll get an email notifying you of any new postings. BTW the first address you will be asked for on the subscribe option is the blog address. Then you’ll be asked for your email address second. Hope you have a joyful spring! If you are at one of my shows- please stop in and say hello! Well the New Year is off to an exciting start! My wrist is getting sore from signing the 1,000+ posters featuring “Sky West.” The Missouri Arts Commission selected my work for the poster image of its Missouri Arts Commission Art Awards 2007. The posters will be distributed to elected and appointed officials throughout the state. The awards themselves will be given at the Capitol Building on February 7th with a reception to follow. Although I am not up for an award, I will still be one of the “honored guests”. Heady stuff! I have been given 100 posters for my personal use. As a subscriber to my email newsletter you may receive one free simply by requesting one--very nicely! These are 24” x 18” and are all hand signed. I’ve ordered tubes for mailing them and I’ll send the posters out after I receive the tubes. Please be sure to include your street address to keep my correspondence to a minimum. I was going to add a photo of me signing the posters but every time I went to do it I was in my pajamas or working on a cluttered area. So you’ll have to use your imagination to visualize my signing all 1,000 posters. Later this week I’ll be flying up to Milwaukee for the January Art Walk at Urban Accents. 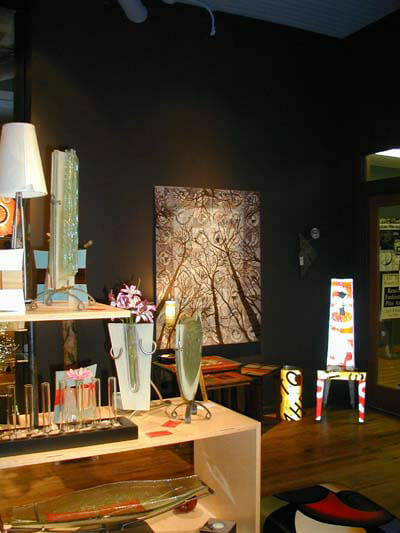 Store-owner, Nancy Rappaport has been working hard to get my work seen in her fine crafts gallery in downtown Milwaukee. I understand people in Milwaukee actually will venture out in the cold winter air to see art! Here’s pictures of her store with my artwork. The temperature is likely to be cold but no colder than we’ve had lately. We were exceedingly fortunate to have completely escaped the recent ice storm that did so much damage throughout the state. Instead of freezing in a house with no electricity like so many of my friends, I got to work comfortably in my studio creating my newest work. Although, by looking at it you’d think I was freezing. 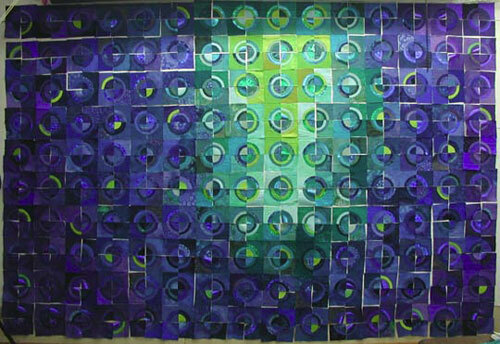 The name of the piece is “Listening for the Silence.” Size is 56” x 42.” It is almost completely hand-dyed silks plus a few metallics. In February I hope to attend the awards ceremony for the National Niche Awards in Philadelphia, PA. “Seeking Clarity” and “A Matter of Perspective” were chosen in two different categories as finalists in the Niche Awards. Over 1150 works were considered in 7 categories. Being chosen as a finalist in two different categories is very exciting. The awards are in late February at the Philadelphia Market for American Craft. Don’t worry. You’ll know if I get one of the awards…..everybody will know! My thanks go out to my friend, Mary Benjamin, at Blue Stem Missouri Crafts in Columbia, MO for encouraging me to enter. Also coming up next spring will be my solo exhibition at MADI Museum Dallas. I believe the opening reception is Friday the 23rd of April. I’m working with a local art center to try to offer a workshop to coincide with the exhibition. I’m planning on spending the next couple of months creating a whole new series of work for this show. It’ll all be geometric in nature. As you may have heard life exploded on us in October. My mother fractured her pelvis. That demanded a radical change in lifestyle. Both Mom and Dad are now living with us. For the 2007 show season I’m planning on mostly shows within a half-day drive of home. That way I can get home in a hurry should the need arise. It will also put less demand on my dear husband who has been incredible throughout all of this. Since I won’t be on the road as much I am hoping to do a better job of marketing via the internet. I’ll be sending my Rebel Quilter News more frequently. I’ve also connected up with an agent who is making pitches to get my work into some large urban hospitals. Go Sandy GO!!!! If you’ve been thinking about having one of my works for yourself—I’d be delighted to create one for you. My show season doesn’t start until the end of March and doesn’t go full bang until May. So I have some create time right now. I’m finishing up a liturgical stole that is a commission and after that I’ll begin the series for the MADI. Don’t put off discussing your ideas with me. We can work things out to fit your needs and time frame. Being an artist is one of the greatest joys I can imagine. Each day I am thankful that I am allowed to play this game. Because of people such as you, who create a demand for my art, I can continue to live my dream. Thank you! Don't miss my new blog, click here to view all my new exiting news. It is Spring! Time to fling open those windows and breathe deep. In my studio that means scooting my trusty plants onto the patio and giving them a sun bath. It also finds me doing close up photos of the tulips, red buds, daffodils, and peonies as they open to the world. The forsythia have come and gone but the clematis is making great strides to get to the top of the fence. I expect I'll incorporate all these in upcoming quilts. My inventory is spread a little thin right now as I have seven pieces out in exhibitions nationwide, twelve in a solo exhibition in Paducah, KY, four pieces at Blue Stem Gallery in Columbia, MO and four more pieces saved out for the Springfield Art Museum's Uncommon Threads exhibition, opening in late April. In my studio I have been experimenting with marbling on silk- still has some work to go! I've also been playing with reds and greens again. I did this one called "Sizzle." Recently I signed with an agent who will be positioning to get my work into corporate, healthcare and hospitality settings. If you know me personally, you know this is a direction I have wanted my work to take. I love the idea of my art having the opportunity to positively affect people on a daily basis. I especially love the ability to work on a large scale. The 2006 show season has started with a bang. My first foray was to the Boston suburb of Marlborough. I did a Paradise City show there. Great venue and the promoter did a great job of getting qualified buyers to the show. I'll be back up in the region in late May in Northampton. Watch for an article about my work in the August issue of Missouri Life Magazine. As a juried Best of Missouri Hands artist I was eligible for this honor. Don't worry I'm sure I'll include a reprint on my website when it comes out. In early March, my solo exhibition opened in Paducah, KY at Maiden Alley Cinema Gallery. This is an independent film house that has a big following in the area. 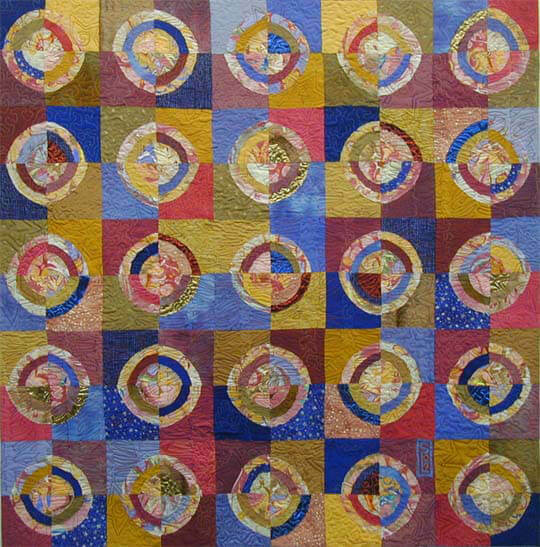 They will be showing films related to quilting during the AQS Quilt Festival the last weekend of April so lots of quilters should be able to view the work. An artist's reception will be held the evening of April 21st. That same weekend in Springfield, MO on Saturday, the 22nd , Springfield Art Museum opens its main gallery with works from Uncommon Threads. 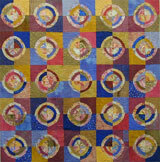 This is the artquilt group of which I am a member. I think the area is in for an eye opening show. There are mostly traditional quilters living here and I hope they are pleasantly surprised. Speaking of museums-I recently heard from the MADI Museum in Dallas. They have scheduled an exhibition of my work next May. More on that later as exact schedules are developed. My thanks go out to Jay and Dottie Kerbow for their help in securing this opportunity. Due to numerous requests received while at shows, I have been developing a series of workshops. They will primarily focus on surface design techniques. One will be specific-addressing metallic options for fiber artists. My first official gig is at the Ozark Folk Center in Mountain View, AR in late October. I'll be teaching a 5-day intensive on surface design. This is a great chance to get a lot of data for a reasonable fee. Surface design is anything that changes the surface of a fabric-dyes, paints, foils, threads, metal leaf, etc. 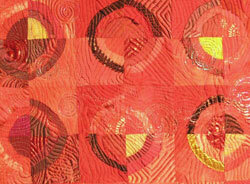 I'll show how to make and use stamps, silks screens, stencils plus lots more. I'll be mostly in my studio until late April. Then it is time to hit the trail. My schedule is posted on my website but upcoming cities include Birmingham, AL, Chicago, IL, Northampton, MA, St. Louis, MO, and Tarrytown, NY. Early May--For those of you who have wished to find a nice SMALL piece of my work I finally have some small framed pieces. 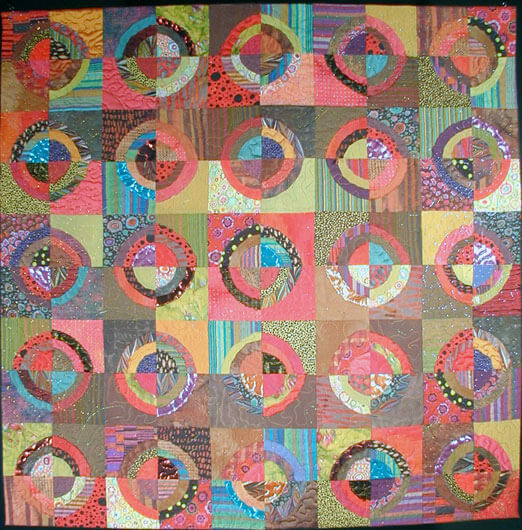 They feature one single block that has been quilted. 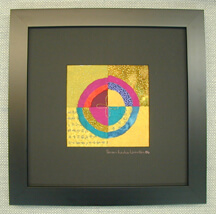 It is mounted with a mat surrounding the block in a 14" x 14" frame. Below is a photo of one of these pieces. 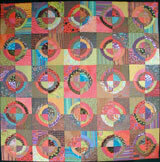 They are created primarily using blocks that remained after piecing my larger quilts. I'm not planning on photographing them individually so you'll mostly have to see them at my shows. They are priced at $96. Thank you for voicing your needing of these sizes. I'm excited to be creating these pieces and have already seen how fast they can disappear. I took 8 of the single block framed pieces with me to Birmingham and brought back 2. I plan on having 37 with me when I leave for points north later in the month. Also, I have made quite a few of my five block quiltlets. This means there will be a much greater selection in a price range of $300. I expect to have about 30 of them with me when I head out. Once again the season is off to an exciting start. While Birmingham ended up very wet in the tear-down portion of the program, the early and middle were great fun. I love Birmingham and Magic City Art Connection works hard to make all the artists feel welcome.